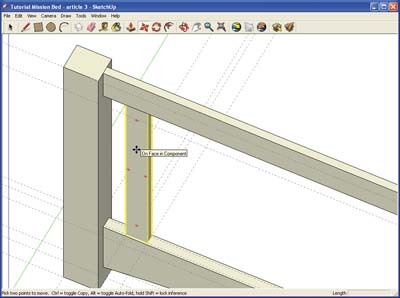 You can now extrude the rectangle you have just created 525 mm, and the first slat is in place! First you need to rotate your view so that you can see the reverse faces of the rectangles you created in the last session. Once again we will use the Push/Pull tool to give the rectangles solidity or thickness. Hover the cursor over each in turn, and as you extrude the rectangles type 30 into the VCB for each one [gallery image 1>. The next step is to shape the lower rail. 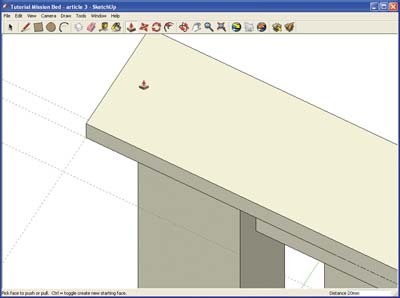 SketchUp makes this very easy for us, as we simply need to draw a curve on the face of the rail, and use the Push/Pull tool to subtract the part we would cut away in reality. 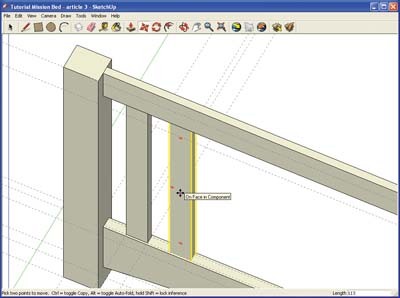 Rotating your view back to the foot of the bed again, select the Arc tool [gallery image 2>, and click on the bottom left hand corner of the lower rail. Without clicking again drag the pointer to the right and click on the bottom right hand corner of the rail, and then move the pointer to to a point somewhere midway between the two ends and above it. Your arc should appear, and as you move the pointer up and down you will see a blue line joining the two mid points and showing you that the arc is being created in a vertical direction, along the blue axis. Again without clicking anywhere, enter 50 on your keyboard and press the return key. This will create an arc 50 mm high at its midpoint. 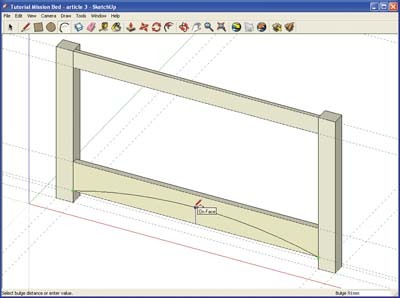 Selecting the Push/Pull tool, move the cursor over the portion of the rectangle below the arc, and then push away towards the head of the bed. 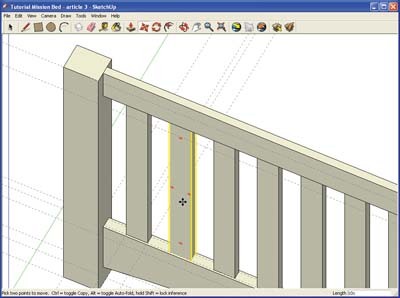 You should be left with your shaped lower rail. Ok, Iâ€™m making it all sound very easy, and once you get the hang of it, with a bit of practice, it is! Remembering to make both rails into components first, you can now move them into their final positions [gallery image 3>, centred on the legs. Selecting both together, and using the Move tool, drag them into position, using the midpoint of the top rail and matching it to the midpoint of the top of the leg. With the two rails now in position, we can now set about creating the vertical slats between them. The slats are 55 mm wide and 20 mm thick, and they are spaced at 58 mm apart, except for the end spaces that are 57.5 millimetres. Using our old friend the Tape Measure tool, position a guide 57.5 mm from the right hand end of the bottom rail [gallery image 4>. Once again to do this you will need to zoom in closer to see clearly what you're doing. Now, create another guide 55 mm to the right of the first one, and then create two guides at right angles to those, 5 mm in from the outer edges of the rail. Using the Rectangle tool, create the basic shape in plan of your first slat, snapping to diagonally opposite corners of the guide intersections [gallery image 5>. 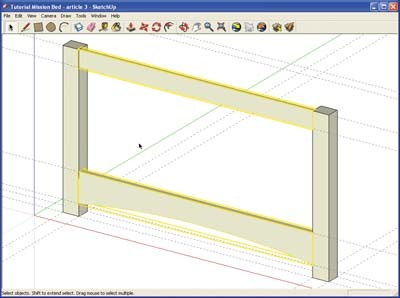 You can now extrude the rectangle you have just created 525 mm, and the first slat is in place! [gallery image 6>. 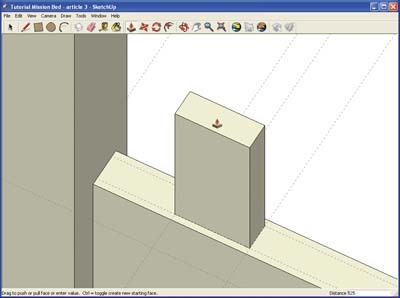 Zoom out and make your first slat into a component in the usual way. Using the Move tool, create a copy of the first slat 58 mm to the right [gallery images 7 and 8>. (Remember, you need to use the Ctrl key, or Option on a Mac) If like me you're hopeless at mental arithmetic I'll give you a hint; you need to enter 113 in the VCB to position it correctly! The very next thing you should do, whilst the Move/Copy tool is still active, is type 10x in the VCB. If you don't get it right first time, and nothing happens, just press undo and try again. 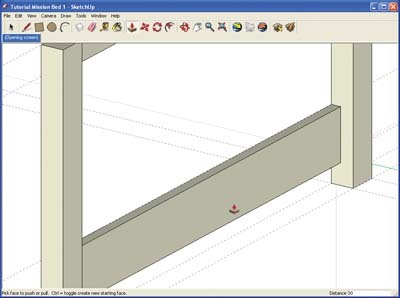 Because what happens next is another one of those magical moments in 3D modelling and one which might make the odd woodworker groan with envy. 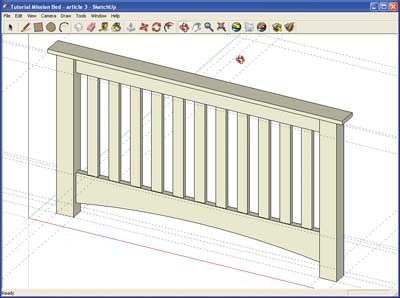 In an instant all the other slats are created at exactly the right spacings. [gallery image 9>. The technical name for this in 3D parlance is an array, and a truly wonderful thing it is to behold when you get the chance to do it. Time to just stand back a moment and admire your handiwork. The footboard of the bed is nearly finished. All that remains is to add the capping piece. This overhangs the legs by 37.5 mm at each end, and 15 mm front and back. We could create a rectangle of guides corresponding to these distances away from the top edges of either leg, in the same way as you did for the slat. 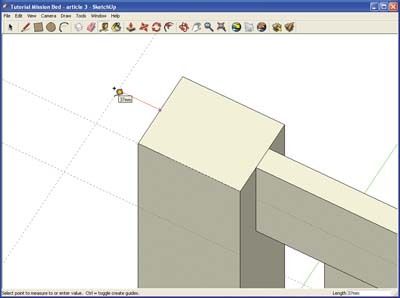 However, I'm going to show you another, quicker way of doing this, since once we have one coordinate, we can create a rectangle that is the right size from that point, and this will give us the shape for a capping piece which will be in position already. If this sounds confusing let's just do it. Create a guide 37.5 mm to the left of the top of the left leg [gallery image 10>. Create another guide at right angles and 15 mm in front of the leg. 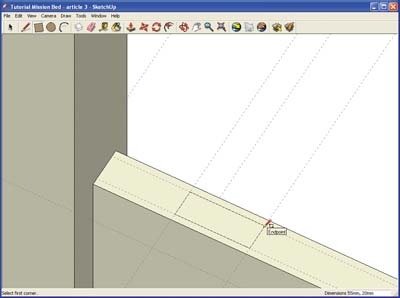 Using the Rectangle tool, snap to the intersection created by the guides and enter 1555, 100 in the VCB. You should have created a rectangle that is the right size in the right place for your capping piece [gallery image 11>, and you can now extrude it using the Push/Pull tool, to a height of 20 mm. Again, remember to create a component from the piece have just extruded [gallery image 12>. The footboard of your bed is complete! [gallery image 13>.